PRODUCT: #8 ROUND BASE BLACK EPDM PIPE FLASHING. 16-1/2" DIAMETER BASE. OPEN TOP. FITS 7" to 13" PIPES. PRICE/EACH. 5/case. 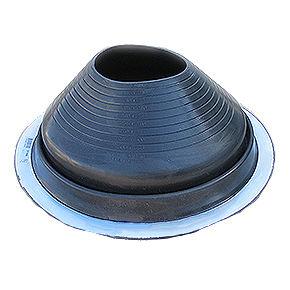 The stepped-cone design makes flashing easily adaptable to most roof pitches.